The YI Gimbal 3-Axis Handheld Stabilizer currently goes for $162~, sold by the YI Amazon store with the order fulfilled by Amazon, so Prime eligible. When you page down under its “Special offers and product promotions”, this is eligible for a 50% off coupon (for the Gimbal price) when you purchase it together with one of YI’s 4K action cameras. Coupon code OZ2GMSFR works for camera-only, and coupon code 4GUGI89I works for camera with waterproof case. The 50% off coupon makes this YI Gimbal cost $81~ more when purchased together with an eligible action camera. Better yet, this coupon promotion is stackable with the four freebies promotion, so for $336 you get the YI action camera, the gimbal and four accessories. If you are thinking of switching to Micro Four Thirds or making a big lens purchase, there is a hot new combined purchase promotion at Amazon that offers stackable combined purchase discounts if you buy one of select cameras and up to nine different participating M43rds lenses. Here is a screenshot of the shopping cart with one eligible Olympus M43rds camera (E-M5 II body) and the nine different Olympus eligible M43rds lenses. As you can see, there are nine different discounts, one for each lens. You can buy anywhere from one to nine lenses, and get a discount for each lens ~ purchased together with an eligible camera. 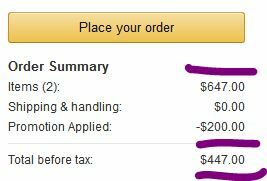 NOTE: ALL items must be sold and shipped by Amazon itself, NOT by 3rd-party sellers if you want to get ALL the combined purchase discounts! Even though two of the above lenses are available in two different colors, for the purpose of this promotion, they count as separate lenses, they each get a discount. 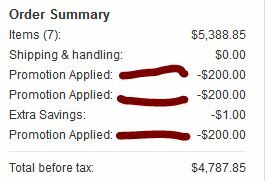 The Nikon combined purchase DSLR + Lens discounts are back at Amazon. You can purchase one DSLR and multiple lenses in the same shopping cart transaction, and receive a discount for each eligible lens. You can see all options at the Amazon promotional page. TIP #2: some of the bundles with free accessories are also eligible for this promotion. For example, when looking at the D5300 options page, carefully peruse to find the color/kit combo with the free extras. The extras are typically an AmazonBasics DSLR bag and 32GB SD card. 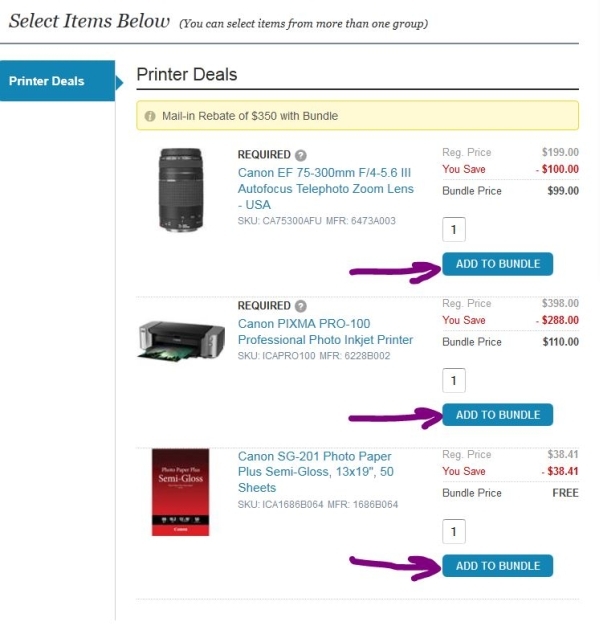 In case you haven’t seen or done one of these promotions in a while, here is an annotated screenshot shot of the top right corner of the Amazon Checkout page with one DSLR and a few lenses added to the shopping cart. To go with the new Canon dSLR Mail-In Rebates, B&H Photo has a bundle centered around the Canon 1D X dSLR. 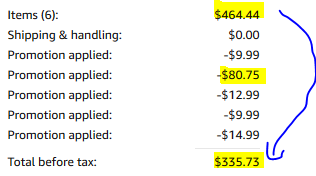 You buy the bundle (just add to cart) and once you receive it and all is well, you file the mail-in rebates. A few weeks later you will receive your rebate amount by mail in the form of a prepaid gift card. This bundle has a checkout price of $6800 and an after-rebate price of $5650. The bundle includes the 1D X body only kit, the Pixma Pro 100 printer, 50pk of 13×19 inch photo paper, shoulder bag, 32GB Extreme Pro Compact Flash card, and Vello wireless remote. Canon has a new incarnation of their mail-in rebates, featuring most of their APS-C dSLRs, including the brand new 7D Mark II. These are mail-in rebates (MIR), not instant savings, so you do have to do the whole MIR song and dance. This round expires on 11/22/14. You can see the available options at B&H Photo. UPDATE: The Canon mail-in rebates continue until 11/22/14… NOTE: this promotion expires at the end of day (Eastern Time) Saturday October 25 in 2014 but don’t wait until the last minute! After your order ships and all the items are performing to your expectations, you can submit the mail-in rebate, paying attention to deadlines and things that need to be included. A few weeks after you submit the mail-in rebate, you will receive a $350 American Express prepaid gift card. 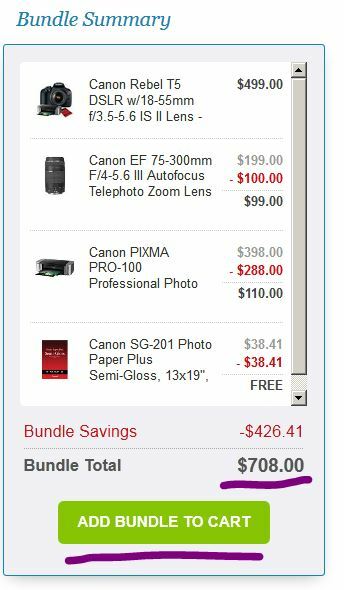 As you can see in the pictures above, this offer includes the Canon D-Rebel T5 with 18-55, plus the 75-300 f4-5.6 III lens, the Pixma Pro 100 printer, and a 50pk of 13×19 inch Canon photo paper. Olympus is currently running a Micro Four Thirds combined purchase promotion. Purchase one camera (eligible options are the OM-Ds (E-M1, E-M5, E-M10), the E-P5, the E-PL7) and up to four lenses from a choice of 15 lenses. 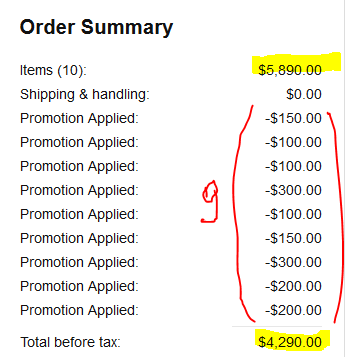 Each lens added to the cart has a discount of either $100 or $200 attached to it. You can add up to four lenses for a maximum savings of $800 per shopping cart! Eligible lenses are high and low, from the 12-40/2.8 to the 14-42/3.5-5.6 II R. It’s a mix of zooms and primes, including one pancake. I didn’t find a promotion-wide expiration date, but the prices of the individual products are good until 11/1/14, so we can perhaps assume that’s the expiration date of this promotion. In a separate promotion, you can get the VF-4 viewfinder for $100 if you purchase it together with the E-P5 body only. This VF4 promotion ends 10/25/14. In yet another promotion, Olympus offers free 2-day shipping with orders of $50 or more. This shipping promotion ends 10/23/14.